Stephen Colbert has always seemed like a nice guy, even when playing an overt jackass like the Stephen Colbert who hosted The Colbert Report. 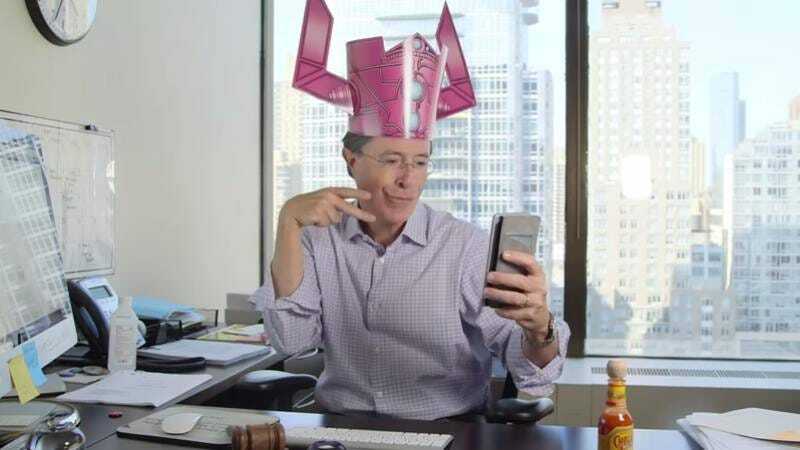 Case in point, he’s taking a break from posting selfies while dressed as Galactus this week to eat lunch with you—yes, you!—for a new daily video series called “Stephen Colbert has Stephen Colbert’s Daily Lunch With You, Starring Stephen Colbert”—or “Lunch With Stephen” for short. Colbert will be posting a new lunch-themed video every day this week so you can pretend that you have a friend you eat lunch with, and this first installment features him pitching an idea for a bed and breakfast where the guests can never leave, a lunch composed entirely of “small” foods, and some helpful relationship advice. Also, there’s a quick gag that Report fans will appreciate involving Colbert and a marker. This video—which you can see below—is a little short, but you can spend the rest of your hypothetical lunch break watching some of his other recent videos. Colbert’s Late Show will premiere on September 8.